I’ve had an informal, very occasional debate with friends like Mike Blumenthal and David Mihm about services like Google’s Talkbin, which allows customers to send private/anonymous text messages directly to a business owner. As I’ve said to them in person, and also briefly mentioned on this blog, I’m not real bullish that it’ll ever amount to anything. And I’m pretty sure I’ve said that I’ve never once seen a business using Talkbin. 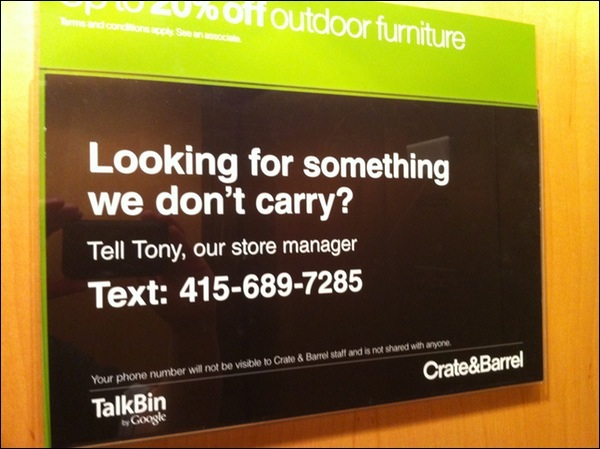 That changed during a recent trip to San Francisco, when I saw this during a stop at Crate & Barrel. Of course, this is San Francisco where a lot of businesses are ahead of the curve. I predict that I’ll never see a sign like this in a local Tri-Cities-area business. I agree that Talkbin looks like another non-sticky piece of spaghetti flung at a wall, Google-style. I’m not sure how much need there is for real-time anonymous customer feedback. I suppose Talkbin is the proposed remedy for that slightly annoying experience one has at a register where the clerk asks, “Did you find everything all right today?”, only to stare at you blankly if you say, “No in fact I didn’t. I was looking for…” You just gave the store valuable information that the clerk will forget in 30 seconds. But I also get how data is accumulated, trends extracted and so forth. My intense desire to have Crate and Barrel carry reticulated framistats will carry zero weight because no one else wants them. I’m only useful as a very small part of a crowd and only as long as my behaviors are similar to others. Can’t you already communicate directly with business owners via Twitter, Facebook, and Google+? Granted, it’s not anonymous but who cares. If a business owner is savvy enough to use TalkBin, I can guarantee you they are already active on one of the big social networks. Amazing how this isn’t a spam comment, yet sounds so spammy…lol. I think Talkbin is a brilliant idea as it helps businesses to be even more closer to their clients, and in the long run it will create a win win situation as clients will be entirely satisfied as businesses will be more attentive to their expectations. I also never heard of the Google’s Talkbin, thanks for informing us by writing this article now I’m moving their to know that how we can use the same.